Grave book is the second part of the Darkness of Djinn trilogy (book one, Dark Djinn, is available free for the duration of this promotion). In the ancient, cultured realm of Myklaan, magic is dying. Lady Jordayne, niece to the shah and second-in-line to the throne is determined to revive it so she can protect her country from both a mortal incursion and the ravages of an evil djinn. She employes ever more ruthless means, which threaten to imperil her soul and offer only a slim chance of success. Will this slim chance of success to save magic be enough? Tia Reed, the author of ‘Grave Ghost’, has kindly set aside a little time to chat with me today about the odds of a seeing a magical future in Djinn trilogy. Tia, before we get to future of the magic, can you share a little of the magical part of this novel. How did these seeds of magical ideas come to life? The idea struck me while I was on holiday in Thailand and standing at the border, close to the Golden Triangle. I thought there had to be a story in an illicit drug trade between three neighbouring countries. From there, over time, with a great deal of daydreaming and even more planning, the idea grew into a trilogy full of magic, djinn, zombies and ghosts. The combination of magic, djinn, zombies and ghosts alone is sure to make a detailed rich story! Was it important to you to ensure specific messages didn’t get stuck in the story, and of course, can you share these strong messages with us? I was striving for strong female leads to show that women can hold important positions in society and, even more importantly, have status in their own right. Unfortunately, while the gender divide is narrowing, there are still too many places in the world women and girls don’t enjoy enough respect, or the freedom to make important decisions about their own lives. It really can be a challenge to show that strong female leads can be important in their own right and make sure the story still rings true. Looking back, was the process to share female strength the area where you felt you learnt the most or did you find another area that was a greater learning experience for you? As this is the middle book of a trilogy, I need to ensure that all details were consistent with the events in the first book and would also lead naturally to the point the second book took off. I had broadly planned all three books, so there weren’t any major inconsistencies, but I did have to develop an eye for detail. Developing an eye for detail is always useful, especially for new book projects. What can you share about the writing project that you’re currently working on? I’m currently rewriting and editing the third and final book in the Darkness of Djinn series as well as planning a new young adult work. Two writing projects! I’m glad to see you’re not holding back your love of writing, but I am curious to find out if you find the process of writing energizing or exhausting? It’s hard to explain but it does both. I’m in my element when I’m writing, and usually energised, but it can take a lot out of me, especially if I dedicate the entire day to writing. My mood also tends to match the mood of the viewpoint character I’m working on. That sounds like you’re thinking as if you were the character as you’re writing. Are the thoughts that the character is having the sole ideas that you have at the forefront of your mind? I’m immersed in the world and the viewpoint character when I’m writing well, so I have whatever is on their mind on mine. But I am often distracted by my dogs and cat. Lots of people bemoan distraction, but I’m not convinced that it’s all that bad. The dogs and cat probably just want to make sure you’re not spending too much time sitting down in front of a screen. They’ve just read all of the articles that say those things are bad and they want to keep you healthy! Plus, a little distraction allows for the introduction of new ideas. So let’s distract ourselves for a minute with some fun questions to see if we can get some new ideas cooking. We’ll start with, if money doesn’t grow on trees then why do banks have branches? *Laughs* I think they’re teasing more than just the authors! On the matter of the possibility of teasing ideas, do you have an answer to the question if space is a vacuum, who changes the bags? I best not tell you about all of the space junk then. Let’s make ourselves happy with something that we both love. Words. What’s your favourite word? Serendipity. I remember learning the word from an old Doctor Who episode and loved the sound and the meaning. Oh, isn’t Doctor Who just a wonderful source of amazing words. I’m still taken by the musicality how the word Gallifrey just rolls of the tongue, but I can see your attachment to serendipity. Since you’ve cast our eyes to the skies, can you share your zodiac sign with us? Gotta love that lion and how even the word ‘lion’ brings strength to mind. Have you invented, or could you invent a monster that you hope brings such a strong image in the readers’ mind like the lion does? And of course, what’s this animal called? There are plenty of those in my books! In Grave Ghost, a baz’waeel is an eel-like monster which lives in the scums, has a few tentacles, horny ridges down its back and a wide mouth full of razor-sharp teeth. With a description like that, I’m hoping that I won’t meet a baz’waeel the next time I leave the house! But for those readers who can’t wait to meet a baz’waeel, they need to go right now and pick up a copy of ‘Grave Ghost’. Tia, thanks so much for sharing a little sneak peek into the spirits that inhabit Grave Ghost, and I think I’ll work up a little courage so I can meet the baz’waeel too! Excited to read the book we discussed today? Find it here on Amazon: ‘Grave Ghost ( ASIN: B078VNH4QV )‘. 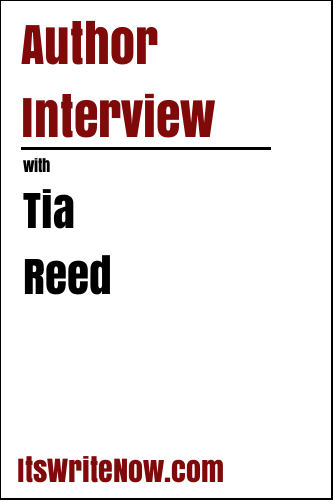 Want to find out more about Tia Reed? Connect here!